The lovely Hannah over at Midnight Violets tagged me recently to do this post - I love these 'getting to know you' types posts, so hopefully you enjoy! 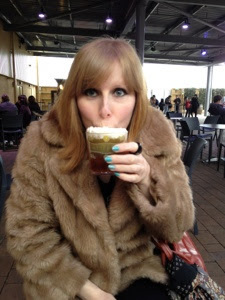 Me - drinking Butterbeer. Yum. I have an unhealthy obsession with all things beauty and really love writing, so decided after many months of reading other blogs that I wanted to start writing my own. 2. What's your favourite lipstick? Not a lipstick per se, but my favourite lip product is Revlon's kissable lip balm stains - my favourite is Lovesick. I love the fact they are so long wearing and Lovesick gives a bold pop of colour that I don't often go for. 3. Where do you see yourself in 3 years time? Still blogging hopefully! I'd also love to have been on another trip to New York. 4. What's your favourite meal? Thai green curry, preferably with beef. Yum! Ummm...I had a bit of a brainstorm and it was the only thing I came up with that I liked! 6. Do you favour drugstore or highend products? At the moment I seem to be using a lot of high end products, but if a drugstore one can do the job just as well, I'll buy that over the high end one. 7. What's your favourite film? I'm not sure I can pick just one - I like a variety. I love Pulp Fiction and Grease - completely different but both so stylish. 8. Who is your biggest beauty idol? Probably Brigitte Bardot. I love the 60's look of heavy liner and pale lips and I just think she looked so beautiful. 9. What's your current favourite skincare product? Right now it's the entire REN Hydracalm range for sensitive skin. My skin reacts with over fragranced products and this range works perfectly for me. At the moment I'm using the cleansing milk, day cream, and F10 mask. 10. If you could only drink one drink for the rest of your life, what would it be? Water! I'm one of these weird people that actually love drinking it. Of course, a few cheeky gins don't go amiss either. 11. And finally, name a few bloggers you're loving - share the love! Gosh, there are so many! I think I have a lot listed on my favourite blogs page, which you can see here. 1. You've got 5 minutes - hair or makeup? 2. What's your favourite product of 2013 so far? 3. What's the thing you like best about blogging? 4. If you could have any pet in the world, what would it be? 5. What's your favourite shade of lipstick? 7. If you could visit anywhere in the world where would you go? 9. You've got £100 to spend on beauty/skincare products - what do you buy? 10. What's your favourite drugstore makeup brand? 11. What would you like to achieve with your blog in 2013? Loved reading it - I really need to try out those Revlon Kissable Balm Stains!